SS-500® standing seam roof system, 360° double lock seal by machine crimped on-site, this unique standing seam roof system is the highest seal nowadays. Other roof systems maybe just simply buckled and clamped, thus is not reliable, and can't bear people walking, wind load, snow load and ice load. 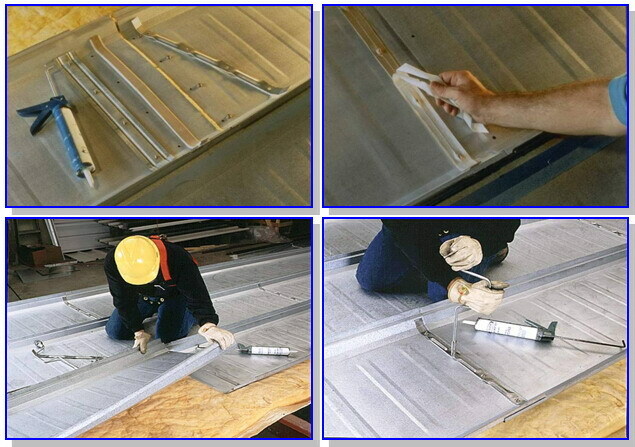 In addition, sealant is pre-coated in the vertical slits at factory to ensure high seal in the case of bad weather. Note: the wind force of BEAUFORT Wind Scale level 11, violent storm, is 0.65kpa,which indicates it has excellent typhoon resistance performance. Clip hidden inside roof panel, seal with roof panel and the supporting structure connected together. Generally, the metal roof panel will expand and contract with temperature changes. To overcome this, the roof clips are designed to free move with the roof panel in two-ways. Without this mobility, roof panel will be pull, drag, leading to roof panel cracking, loose fasteners, roof clamping damage, and eventually lead to roof leaking or damaged by huge winds. Most manufacturers will arrange panel joint in a straight line. It is difficult to ensure the seal in the joint of panels at the four corners.Unibuildings design staggered end lap of roof panel, in order to avoid this situation, ensure that the climate stability tightness, and provide advanced high strength roof system. 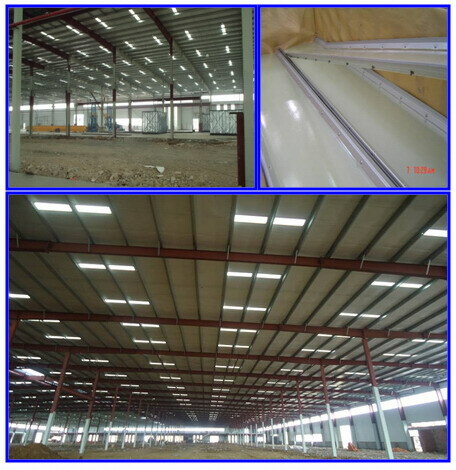 Usually, roof panel need to be lapped for large span building. Most manufacturers will not overlap in the location of the support purlin. Due to lack of support structure on overlapping direct, when installation or other people walk on the roof, even the weight of the snow, will crush the overlapping part. To prevent this situation, Unibuildings specially designed the lap position on roof purlin. According to research and production practice, 90% roof leakage are derived from the roof opening. 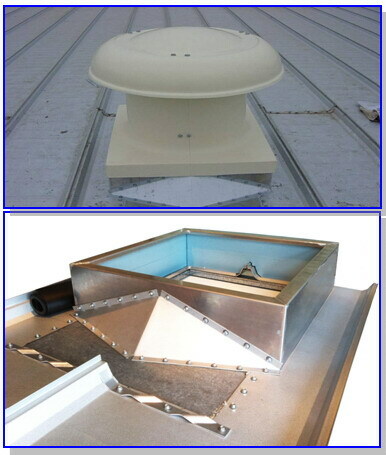 Unibuildings design and manufacture each roof opening assembly precisely, thus to avoid the on-site treatment. 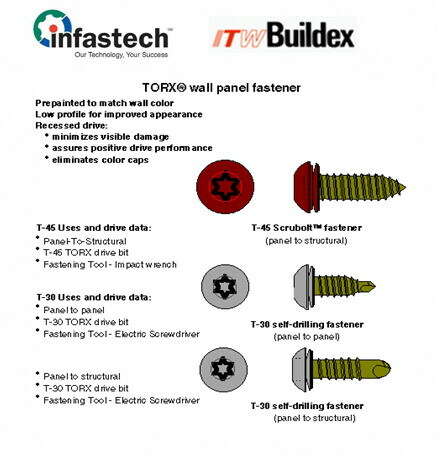 Compare with exposed fasteners used by other manufacturers, Unibuildings design concealed fastener, eliminates the possibility of leaking. * Excellent performance of SILICONE waterproof cover, allowing 60°- 200°,changes in temperature interval of 250 degrees, with precise design of the roof openings, solve the waterproof of multi hole roof. Accurate alignment of roof panel is crucial for roof installation. The roof panel arranged irregularly will not only affect the sealing of roof, will also affect the sealing strip, roofing accessories and trim installation. The roof and the structure of all type of SS-500® roof systems are pre-punched in workshop in order to ensure the correct arrangement of roof panel. 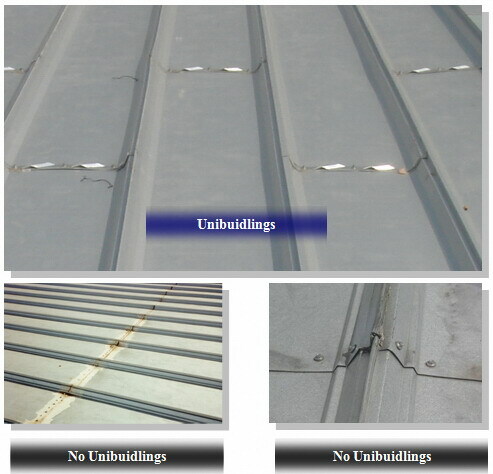 Due to the molding machine error, cumulative gross measurement error and error due to workers toil, standing seam roof cannot slide because of bending stress concentration, most likely lead to leakage or ripping of end lap and sealant. * Lite panels : 2%-5% of total roof area. Reduce wall windows, save cost. * Outdoor layer can withstand 1500 hours by accelerated aging test, without glass fiber exposure and PVDF coating spalling etc. * Due to thermal expansion and contraction coefficient of steel panel and lite panel bring the different slip dislocation and sealing adhesive failure, resulting in water leakage (pictured above) and the light glare and heat.